Last June took place in Brussels the kick-off meeting of the European project DRIVE (Diabetes Reversing Implants with enhanced Viability and long-term Efficacy), consortium involves fourteen partners from seven European countries, has received €8.9 million funding as part of the Horizon 2020 – Research and Innovation Framework Programme. The DRIVE programme will develop natural materials and new surgical devices to enhance the transplant and survival of insulin producing pancreatic islets for the treatment of diabetes. DRIVE project is co-ordinated by Dr. Garry Duffy, Department of Anatomy and Tissue Engineering Research Group, Royal College of Surgeons in Ireland. 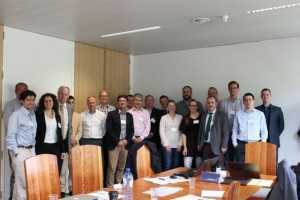 Prof. José Luis Pedraz, led of the Nanobiocel Group of CIBER-BBN in the Universidad del País Vasco (UPV/EHU) and coordinator of the Unit 10-Drug Formulation of NANBIOSIS, participates in this consortium. Diabetes mellitus is a chronic disease characterised by high blood sugar (glucose). If not treated carefully, diabetes causes several debilitating side effects including heart disease, damage to the eyes, kidneys and nerve endings (e.g. hands, feet) and can lead to premature death. The total number of people living with diabetes in Ireland is estimated to be over 225,000. According to the international diabetes federation (IDF), 382 million people worldwide have diabetes and in 2013 an estimated 5.1 million deaths were attributable to the disease, representing 8.4% of global adult mortality. Blood glucose is high in diabetes because of the inability of the pancreas to produce sufficient insulin, a hormone that controls blood sugar. Currently the main treatment for diabetes is the daily injection of insulin. In patients where control is poor, transplantation of pancreatic cells (which contain insulin-producing β-cells) is possible. However there are challenges with this therapy including the short supply of donor pancreases, the need to use 3-4 pancreases to get enough β-cells for treatment and poor graft survival and retention at the transplant site. The DRIVE consortium will address these challenges by developing a completely new system to deliver pancreatic β-cells effectively in a targeted and protected fashion. This will mean that fewer donor pancreases are needed for cell transplantation allowing more patients to avail of a more effective longer-lasting treatment with less demand on donor pancreases. Additionally, the consortium will investigate the combination of DRIVE’s technology with future stem cell-derived β-cells that will widen the availability of islet transplantation therapy to all insulin-dependent patients. 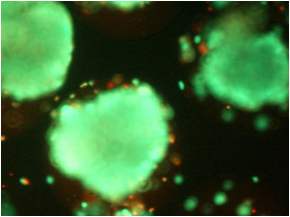 DRIVE’s β-System consists of a β-Gel, which contains the pancreatic β-cells within a pancreas mimicking gel; which itself is protected within a capsule called a β-shell. This is delivered using a specialised injection catheter, called β-cath, which offers a more minimally invasive surgical procedure than is currently used. The current transplantation technique offers patients natural glucose control for 1-2 years. DRIVE’s β-system aims to provide control for up to 5 years by increasing the longevity of the β-cell transplant. The system offers further advantages through the slow release of immunosuppressant drugs by the β-shell, reducing the patient’s need for long-term anti-rejection medication, which has harmful side effects. The β-shell will also be retrievable, so it can be removed and replenished after the 5-year period. DRIVE’s 5-year work plan will include animal testing, with a view to human testing at the end of the project. The DRIVE Consortium represents a major interdisciplinary effort between stem cell biologists, experts in advanced drug delivery, research scientists, clinicians and research-active companies working together to develop novel therapeutics to address the challenges of treating diabtes. The researchers will optimise adult stem cell therapy using smart biomaterials and advanced drug delivery, and couple these therapeutics with minimally-invasive surgical devices. The project has recived funding from the European Union’s Horizon 2020 research and innovation programme under grant agreement no 645991.